Devorah Sperber deconstructs then reconstructs art masterpieces using hundreds of spools of thread in meticulously chosen colors and arrangements, giving a tangible materiality to the way that pixels form a digital image. Sperber’s works are actually abstractions that only coalesce into a famous work of art when viewers step up to a mark and peer through a small ocular sphere perched on a stand. This physical interactivity with art — and science and technology as well — delights the eye and brain while summoning our collective consciousness of works by Picasso, van Gogh, Warhol and the like. We don’t need to see these pixelated works as exact copies; our minds fill in the gaps. Included here are nine installations by this internationally known artist, most of which are suspended by thin chains. In a work such as “After Monet (Water Lilies) 2,” with its 4,560 spools tightly stacked against each other and stretching almost 9 feet, it’s an optical feat as to how slight variations in blue spools of thread yield a facsimile of the famous work through the oculus. 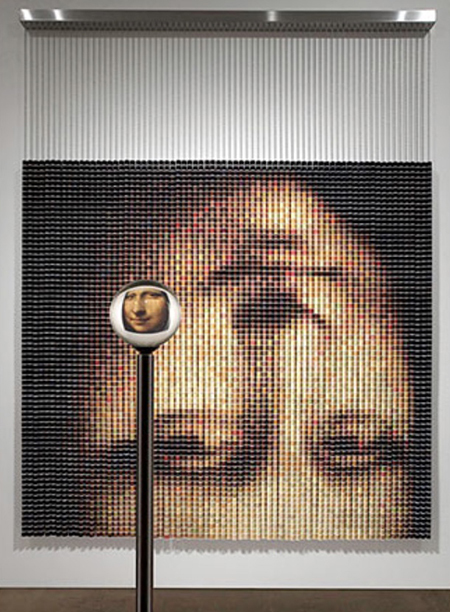 A smaller work, “After da Vinci 1 (Self Portrait),” depends on a mere 442 spools, ranging from pale orange to yellow to dark brown. A different spin on the conceit is “After Holbein 1,” in which chenille stems are arranged seemingly at random around a stainless steel cylinder. Walk around the installation and Hans Holbein’s “The Ambassadors” emerges.